Publisher: Suburban Citizen Newspaper Co. Description: Little is known about the origins of the Suburban Citizen, and no extant issues of its first two years exist. 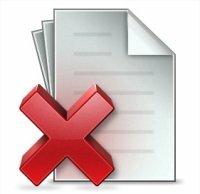 The Library of Congress holdings, which are sporadic and incomplete, are the sole holdings documented; they begin with the February 4, 1893 paper and end with the December 27, 1902 issue. The newspaper apparently began publication on January 1891 as a four-page weekly that promoted real estate development and sales. According to the Washington Post, however, the Suburban Citizen, in its quest for increased circulation, soon began placing the “raciest bits of scandal” that the editor “could find or invent” amidst its real estate advertising. The Post asserted that one particular issue might have “put the Police Gazette to shame, and it wasn’t published on tinted paper either.” Despite its efforts to titillate and attract subscribers, the weekly apparently encountered financial difficulties. The Post reported in December 1892 that it had ceased publication and that its editor had purportedly run off to Hawaii. 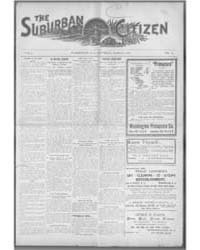 Early the following year, however, the paper reappeared with its publisher—the Suburban Citizen Newspaper Company—now identifying it as “a journal devoted to the interests of the residents of the Suburbs of Washington.” It profiled neighborhoods, local businesses, and prominent local citizens, especially those living in Northeast Washington where the paper’s presses operated. On August 19, 1893, the newspaper doubled in length to eight pages, retaining its $1.00 yearly subscription and five cent per copy pricing. The publisher and business manager was James M. Wood, a thirty-three-year-old former War Department auditor. The newspaper became an advocate for area small businesses and championed the cause of local florists fearful of a proposed federal free flower program. It also endorsed efforts by the Northeast Suburban Citizens’ Association to promote neighborhood growth and business development along Rhode Island Avenue and Bladensburg Road in Northeast Washington. James Wood was secretary of that citizens’ association. The paper also reported on area Masons, the American Legion, and local railroad and public roads development. Serialized fiction and humor joined columns on farming, household hints, fashion, and science. Over time, advertisements became more numerous, and news coverage expanded to include more national and international stories. Despite these changes, the paper continued to focus primarily on topics of interest to residents of Northeast Washington and its adjacent Maryland suburbs. The reasons are unclear as to why the paper folded. Its publisher, the civic minded James Wood, continued to champion local causes and eventually went on to become the city’s superintendent of street cleaning.